"The Superbowl of Motocross", Supercross! Ever wonder where Supercross came from? What's the difference between Supercross and Motocross? 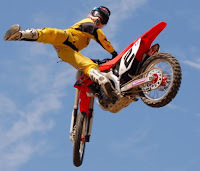 Motocross was popularized in Europe during the 50's and 60's and comes from combining the word motorcycle with cross country. Most events were held in pastures or open fields. July 8, 1972 the first organized Motocross race was successfully held inside the Los Angeles Coliseum. Race promoter Michael Goodwin referred to the event as "the superbowl of motorcross". The term "Supercross" was coined. Supercross is tailored to the tv spectator. The tracks are technical, not as fast as Motocross, but technically more difficult. Part of Supercross is the showmanship that came about as a result of the larger crowds and closer interaction to the fans during the race. Ricky Carmichael may always be known as the GOAT(greatest of all time), but before Carmichael was the King, "The King Of Supercross" Jeremy McGrath. McGrath started racing Supercross in 1989 and during his career won a record 72 250cc class main events, a record that has not yet been surpassed. McGrath earned another nickname of "showtime" for his ability and willingness to throw tricks in the air such as one trick that he invented called the "Nac-Nac" , (opposite of "Can-Can") which involves the rider moving their leg over the bike, extending that leg out, while keeping the other leg on the foot peg. Since Motocross tracks are located outside the confines of a stadium and incorporate natural terrain as part of the course, the track can, and most times is, more laid out in design often involving higher speeds, more climbs generally a less technical design. The races are longer than Supercross, usually close to 40 minutes. 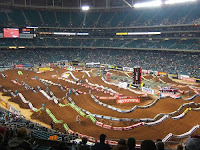 As stated before, Supercross tracks are tailored to the audience so the track must fit in a smaller area in an outdoor or indoor stadium where the fans can view the action. The turns are tighter and more technical so the speeds are lower, but the jumps and obstacles make up for this by being tight and technical. Supercross has a little more of a rhythm to it and riders that can master this rhythm, quickly move to the front of the pack. Double jumps can sometimes be turned into triples etc. by the more advance racers shaving seconds off lap times any way they can. Timing and precision becomes more important than speed in Supercross, and big jumps are placed in the track to please the crowd and make the race more exciting. 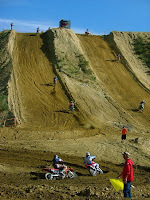 The stadiums can also be reached easier by more people than the fields and rural areas of Motocross. So which one is really more enjoyable to watch or compete in? I suppose that ends up being up to us! Since Supercross tends to be more advertised and televised it tends to draw the bigger crowds and attention, but being that events such as Motocross, Enduro, Freeride, etc. are on natural terrain instead of man made jumps and obstacles, people who chose to ride on natural terrain instead of tracks tend to find more of a connection with these types of events. It's good that both still exist and even more events are popping up all the time to feed the need!